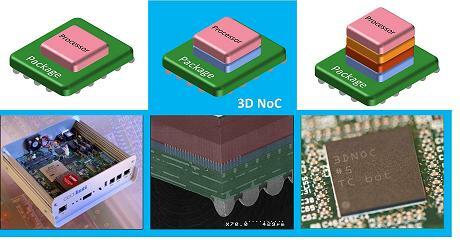 In a three-dimensional semiconductor device fabrication achievement, IRT Nanoelec, CEA-Leti, STMicroelectronics and Mentor Graphics have developed a 3DNoC IC device based on a 2D semiconductor die that can be used in a stand-alone applicative mode, and also in a 3D stack with several dice, to multiply the processing performance of the system. "The technology developed for this realization can be easily used and transferred to address mixed-technology applications, such as imagers and RF transceivers, or complex digital processing, such as high-performance computing and programmable devices," said Severine Cheramy, IRT 3D program director. "In parallel with these results, we are working on developments that address more fine-pitch 3D technology than those used in the 3DNoC demonstrator and solutions for thermal dissipation, temporary bonding and stress issues." 3D-stacking enables integration of different technologies and simplifies the use of small-sized dice to improve modularity and increase yield which reuses the die instead of IP in case of a monolithic integrated circuit type SOC. Such IP physical blocks are called chiplets. 3DNoC chip was defined and designed by Leti, with the direct support of STMicroelectronics, using a specific add-on 3D design kit and a set of 3D sign-off verification tools provided by Mentor Graphics. CMOS technology, 3D technology and packaging were realized by ST and Leti, with a "via-middle option" in 65nm CMOS technology. The test and demonstration platform is a joint development among the three partners. 3DNoC chip addresses baseband processing, but all the technology and design bricks are reusable across a range of other applications. 3DNoC stacking is similar to HMC or HBM memories and uses 3D network link bandwidth of 450 MByte/s. In case of DRAM, byte capacity is multiplied by the number of elementary dice stacked whereas in case of 3DNoC circuit multiplies processing performance. Using this technology identical 65nm CMOS digital dice can be bonded using a face-to-back technology to build a stack of processing elements, using 10µm-diameter through-silicon via (TSV) and 20µm-diameter µpillars and µbumps. In the IRT Nanoelec demonstration, two dice are stacked. while the number of signals is constant regardless of the number of stacked dice. Area occupied by the 2,000 TSVs represents about 1 percent of the whole die area (72 mm2) and wafers are thinned to 80µm for TSV revelation at the backside. 3DNoC is mounted in a 581-ball, 0.3mm-pitch BGA package using a stacking-last approach, i.e. the bottom die is bonded on the substrate and after the top one on the bottom. The digital modules embedded in 3DNoC are computing-intensive IPs, processor cores and programmable DMA engines connected to the NoC routers using a dedicated interface compatible with a packet-switching mechanism. The global architecture was partitioned in a scalable way to address several modes, depending on the number of antennae used for transmitting-and-receiving levels. The modular elementary die was sized to fit the processing performance required to support the single antenna mode and, by stacking two or four dice, more complex multiple antenna modes are supported. As an example, the 3DNoC chip developed in this project can support up to two antennae for both TX and RX. The elementary die of the 3DNoC integrates four 3D routers to ensure vertical communication. Redundancy and fault-tolerance are used in the 3DNoC circuit at both communication and processing levels. Using asynchronous logic for router implementation allows implementing robust 3D communication interfaces without any delay assumption, and makes dynamic voltage and frequency scaling (DVFS) for power optimization easier, relative to processing requirements and thermal constraints. Mentor Graphics' power and thermal analysis tools were used to architect the 3D floor plan of the 3DNoC chip. Calibre 3DSTACK tool has been used for final sign-off verification of the 3D assembly of the two dice.